Winter hardy to USDA Zones 8-10 where it is typically grown in average, alkaline, dry to medium, well-drained soils in full sun. Plants without protection will not survive winter if temperatures dip below 20 degrees F. It is best to grow this lavender in sheltered locations with a good winter mulch in Zone 8. Full sun and well-drained soils are especially important. Cool, moist conditions often lead to root rot and stem rot. Soil drainage is particularly import in winter. Remove faded flowers to promote continued bloom and maintain plant appearance. Prune to shape in spring after new leaves appear. 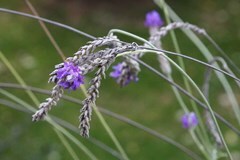 This species differs from most other species of lavender by having much better tolerance for summer heat and humidity and by preferring moister soils with some organic enrichment. North of Zone 8, plants may be grown in pots/containers that are overwintered indoors in sunny locations. Plants are fast growing and may be grown as annuals with seeds started indoors in spring 6-8 weeks before last spring frost date. Lavandula multifida, commonly called fern leaf lavender, is a highly aromatic, fast-growing, everblooming plant that typically grows to 24” tall on straight stems clad with dissected fern-like gray-green leaves. It is native to the warm climates of the northwestern Mediterranean plus the Canary Islands. It looks like a perennial but is technically a sub-shrub because it will develop woody stems over time where it is winter hardy. Deeply-lobed, lacy, silver-green leaves (to 1.5” long) are usually twice pinnately divided into narrow segments. Blue-violet flowers (to 1/2” long) bloom in dense showy terminal spikes (to 2 ½” long) atop stems rising above the foliage to 6-18” tall. Flowers bloom throughout the year in warm winter locations. Flowers primarily in summer when plants are grown as annuals. Specific epithet means much divided in reference to the plant’s winged spikes. Susceptible to leaf spot and root rot. Plants may not survive in winter if soils are not well-drained and/or if temperatures dip below 15 degrees F without protective snow cover. This is a versatile garden perennial that should be considered for a wide variety of uses and not just relegated to a corner of the herb garden. Deep purple blue flowers and gray-green leaves provide ornamental color and contrast to the perennial border front, rock garden, cottage garden, herb garden or scented garden. Can be particularly effective when massed. Good selection for edging along walks or paths. Excellent cut or dried flower. Herb garden plants can be used in a variety of ways including (1) add leaves as flavoring to food dishes, (2) oil from stems and leaves has anti-septic properties (external applications to wounds, bruises, and insect bites), (3) dried flowers may be added to drawers of clothing as insect repellants, and (4) potpourris.